One would think the increased use of hands-free phones and other devices would increase drivers’ focused attention on the road. 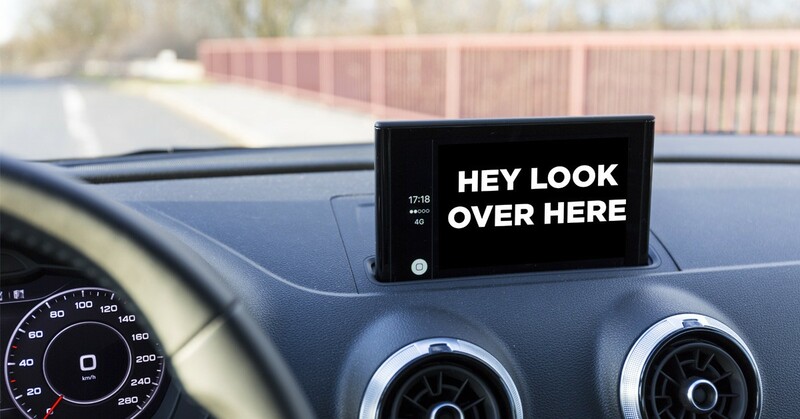 In fact, the increase in car infotainment systems is bringing MORE opportunity for distraction rather than the intended purposes of lessening such distractions. According to the AAA Foundation for Traffic Safety, research shows that drivers using voice-based and touch screen features in their vehicles were distracted for more than 40 seconds when performing complex tasks such as programming their navigation system. In addition, 23 of the 30 vehicle infotainment systems studied placed high levels of demand on drivers. These seemingly innocuous distractions can pose grave consequences as more and more drivers on the road are distracted for potentially dangerous periods of time. In-car entertainment (ICE), also known as in-vehicle infotainment (IVI), is defined essentially as hardware and software within an automobile that provides audio or video entertainment. Instead of controls and knobs, now these components are controlled by voice and touch screen. While it sounds less hands-on and time consuming, it still needs the attention of the driver. Not only are drivers visually distracted, they are also mentally distracted as well, which can be even more dangerous. Did you know that taking your eyes off the road for even two seconds can double the risk for a crash? AAA says that one in three adults uses infotainment systems while driving, making for a dangerous combination on the roadways. These days, your car’s dash resembles a mobile PC more than anything else. The global market for such infotainment systems in passenger cars will hit more than $35 billion by 2020, driven by advancements in voice recognition technology, HD display monitors, smartphone integration technologies, and responsive touch screens. The trend shows no signs of stopping despite the rise in distracted driving. More than 65% of car infotainment systems projected to be sold by 2020 around the world will feature smartphone integration capabilities. In 2015 alone, distracted driving claimed the lives of nearly 3,800 people and injured 391,000, according to the NHTSA. Distracted driving is anything that takes the driver’s eyes off the road. Infotainment systems certainly contribute in a big way to this distraction. But texting remains the biggest distraction. 9: The number of Americans killed every day from accidents involving distracted driving. 1 to 2: The number of seconds a driver can safely glance away. 5: The number of seconds it takes to read or write a quick text message. The increase in car crashes due to distracted driving is further exacerbated by the fact that many people still don’t use their seat belts. It seems it also has something to do with where you live. The CDC says people living in rural areas represent 19% of the U.S. population, with rural roads making up 57% of the more than 22,000 passenger vehicle occupant deaths in 2014. Most motor vehicle crashes happen in urban areas but more and more crashes on rural roads are claiming more lives. The speeding that people do on these long and winding roads, coupled with lower seat belt use in rural areas, contributes to these higher numbers. Situations with already higher chances of injury or death are only made worse by distracted driving. If you’re on the road, do yourself and everyone around you a favor – pay attention to the road! Do all your programming in advance, before you begin moving. If you need to give your dashboard serious attention, please pull safely over to the side of the road and stop moving. Have you been the victim of a car crash as the result of driver distraction? We can help you secure the compensation you need to pay for your hospital and medical bills. You shouldn’t have to pay for the poor choices of someone else. Call Power Legal Group now at 800-323-POWER.